It’s here! It’s here! It’s here! 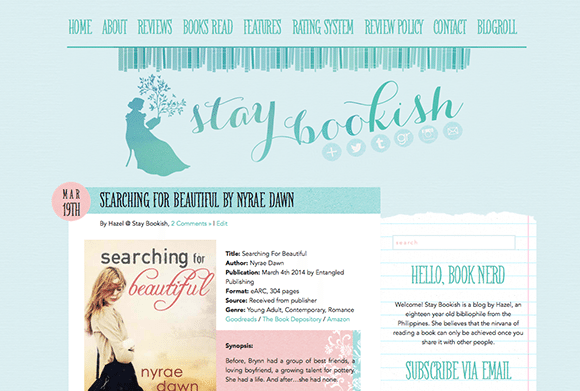 Stay Bookish has a new design and it’s bright and bubblegum-colored! 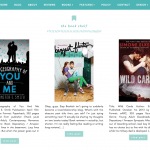 I’ve recently been hinting about how much I want to redesign my blog. As much as I wanted to then, college has kept me busy. But I just finished my finals recently which means I’m done for the semester and can enjoy summer! Originally, my plan was to read and read and read but I got a mild fever and a terrible sore throat two days ago which weirdly enough was when a design idea came over. I started creating a draft on photoshop, not really meaning to use it at first. I’ve never done the psd to website design transition before because I’m pretty amateur when it comes to CSS and coding. And then I got to thinking that now would be a great time to learn how to create a theme from scratch. So I did. I have to say- it wasn’t an easy task. In fact, it was damned hard but thank god for Google. I would not have survived this if it weren’t for all those tutorials online. Although I still made a lot of guesswork, I’ve learned so much as I was designing this theme. I can’t wait to learn more! After all the buzz I’ve created because of my overexcitement for this design I’ve been doing, this big reveal must have turned out to be anticlimactic. Still, I’m so proud of of what I’ve done! To those who’ve expressed their excitement over twitter, and for those who’ve given me some tips, like Mitchii and Georgie, THANK YOU SO MUCH! I’m really hoping you guys will like it! PS: I’ve spent several hours scouring for errors but I know there are still several glitches hiding around. If you guys find any, please do tell! It’ll be a great help! Bubblegum summer fits perfectly! It’s refreshing, subtle and notebook-ish. I love the tree in the header and the upside down row of books. So very cool and it’s awesome that you’re learning coding. I plan to venture further into it this summer. Congrats on your first theme from scratch!! I remember when I made my first one. It can be complicated as hell the first time. But once you do it a few times, it all just clicks. AHHHHH I LOVE IT HAZEL! <3 BEAUTIFUL! This is so good for a first try, I wouldn't know that if you didn't say it! 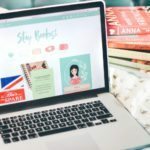 May I know what font do you use for your blog header? :D And your blog color is one of my favorites — blue and green. The theme name fits well too! Sorry if I used too many exclamation marks haha! Such a beautiful design Hazel! I’m pleased you were able to create it from scratch too as I know it can be quite a challenge if you’re not quite experienced with coding. What a pretty new design! I love it. I really liked your previous design, but this one’s beautiful as well! My favorite has to be the notebook-like sidebar. I have a thing for torn-off pieces of paper. ;) And I love love love how you put your social media buttons into the header. Never figured out how to do that, and I can’t image map, so… Anyway, congrats on finishing your finals! So envious of everyone who’s already finished high school because it’s like they have so much time on their hands (though that’s probably not the case). I love the header, footer and the sidebar! Beautiful as always. You make me want to redesign my blog too. I just have to overcome my laziness first. Haha! Ohmygosh I am so completely in love with everything about this design! The silhouette, the font, the colours! I love the new design! I have recently decided that I want to do my design from scratch, and it’s really great to see that somebody else actually managed to do that. I lurrrve the new theme, Hazel! <3 Especially the girl with the book and the tree! Super pretty. I need to steal some of your blog designing talent, haha! I love the gradient in your header! I love your new design Haze. It is fun and kinda cute without being childish. I even like you new blog button. It is just so lovely. Now I want to redesign my blog. Damnmit woman!! :D I’m so busy with my post grad classes I rarely have time to even do reviews. Come summer and I’ll have to do something too. Congrats on the new theme! I like it very much!!! It’s so fresh! It is ABSOLUTELY GORGEOUS!!! I don’t know if I can say that enough times. I just love the colors and the design and everything just works so beautifully. So, so beautiful. Oh, wow, Hazel! It’s absolutely beautiful! You just keep outdoing yourself time and time again. Congratulations on coding your first theme! The hard work really paid off! I love love love the new design Hazel. So gorgeous. I also do a lot of googling for setting up my blog. :P but I think you did a far better job. Love it! You did an amazing job!!! !